HOUSTON--(BUSINESS WIRE)--Contango ORE, Inc. (“CORE” or the “Company”) (OTCQB: CTGO) announced today that Peak Gold, LLC (“the Joint Venture”), the Company’s joint venture with Royal Alaska, a wholly-owned subsidiary of Royal Gold, Inc., has approved a budget for the first phase of calendar 2018 activity for approximately $9.1 million, of which the Company’s share would be approximately $5.1 million. 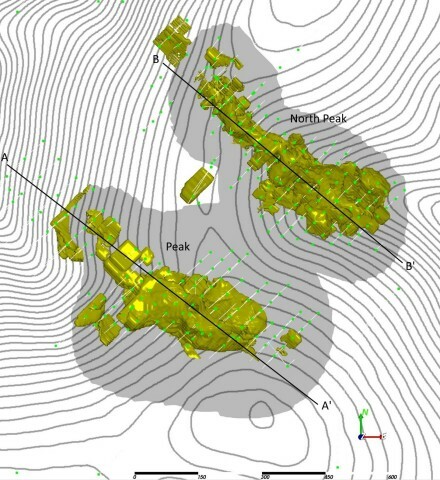 The budget is designed to define a path to commercialization of its current resource, explore for a third skarn orebody in close proximity to the Peak/North Peak orebodies, and to acquire data that would help evaluate the potential for porphyry or epithermal deposits on the Joint Venture’s lease. A Phase II activity budget would be dependent upon results from this approved Phase I budget. Included in the budget is 6,900 meters of exploration drilling that we expect to commence in April. Also included is 74 line kilometers of IP and Titan EM surveys that should also begin in April. In addition, the budget has costs associated with evaluation and economic analysis of the Peak/North Peak orebodies which should be completed by the end of September 2018. Attached are longitudinal sections through the Main Peak and North Peak deposits, along with a plan view map indicating the trace of the longitudinal sections. CORE is a Houston-based company that engages in the exploration in Alaska for gold and associated minerals through Peak Gold, LLC, its joint venture company with Royal Gold, Inc. Additional information can be found on our web page at www.contangoore.com. This press release contains forward-looking statements regarding CORE that are intended to be covered by the safe harbor "forward-looking statements" provided by the Private Securities Litigation Reform Act of 1995, based on CORE’s current expectations and includes statements regarding future results of operations, quality and nature of the asset base, the assumptions upon which estimates are based and other expectations, beliefs, plans, objectives, assumptions, strategies or statements about future events or performance (often, but not always, using words such as "expects", “projects”, "anticipates", "plans", "estimates", "potential", "possible", "probable", or "intends", or stating that certain actions, events or results "may", "will", "should", or "could" be taken, occur or be achieved). Forward-looking statements are based on current expectations, estimates and projections that involve a number of risks and uncertainties, which could cause actual results to differ materially from those, reflected in the statements. These risks include, but are not limited to: the risks of the exploration and the mining industry (for example, operational risks in exploring for, developing mineral reserves; risks and uncertainties involving geology; the speculative nature of the mining industry; the uncertainty of estimates and projections relating to future production, costs and expenses; the volatility of natural resources prices, including prices of gold and associated minerals; the existence and extent of commercially exploitable minerals in properties acquired by CORE; potential delays or changes in plans with respect to exploration or development projects or capital expenditures; the interpretation of exploration results and the estimation of mineral resources; the loss of key employees or consultants; health, safety and environmental risks and risks related to weather and other natural disasters); uncertainties as to the availability and cost of financing; inability to realize expected value from acquisitions; inability of our management team to execute its plans to meet its goals; and the possibility that government policies may change or governmental approvals may be delayed or withheld, including the inability to obtain any mining permits. Additional information on these and other factors which could affect CORE’s exploration program or financial results are included in CORE’s other reports on file with the Securities and Exchange Commission. Investors are cautioned that any forward-looking statements are not guarantees of future performance and actual results or developments may differ materially from the projections in the forward-looking statements. Forward-looking statements are based on the estimates and opinions of management at the time the statements are made. CORE does not assume any obligation to update forward-looking statements should circumstances or management's estimates or opinions change.